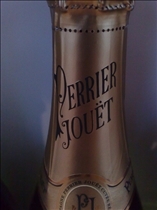 Perrier-Jouet is a type of Champagne created in the Epernay area of France. In 1811, Pierre-Nicolas-Marie Perrier founded the Perrier-Jouet house and has been creating vintage and non-vintage types of wines ever since. The Jouet part of the house's name comes from Pierre's wife's maiden name. Dom Pérignon Champagne was named after Dom Pérignon who was a Benedictine monk. Legend says that Dom Pérignon discovered the method of making Champagne, but that is not actually true. Dom Pérignon actually did develop a way to improve the quality of wine by blending the grapes in a different way. Dom Pérignon also established the use of cork to fasten the bottles. Dom Pérignon is considered a vintage wine so it is not made during weak years and the grapes harvested are used in the same year. Overall, Dom Pérignon's style is of a mature, complex and tangible sensuality. The bouquet is said to be a distinctive blend of vanilla and sandalwood. Perrier-Jouet Brut Champagnes have varied tastes from citrusy, apple, pastry and even a hint of coffee in some. Pale in color with a fine bead, Perrier-Jouet is known for its spiraling bubbles and delicate bouquet with subtle, yet complex flavors. Perrier-Jouet was the first house to create a dry Champagne in 1854. Until this time, wines were mostly sweet. The designation of Brut Champagne is how dry Champagne is commonly known. Perrier-Jouet wines were enjoyed by royal courts such as Queen Victoria and Napoleon III. In addition to Brut Champagne, Perrier-Jouet also produces Rose and even Extra Dry varieties. 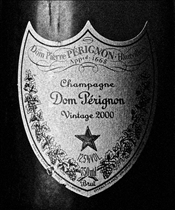 From 1921 until 2002, Dom Pérignon has only been produced during 36 years. The rose variety began in 1959 and has been produced only 21 times. There are only three varieties of Dom Pérignon - the Standard Champagne (Brut), The Rose Champagne, and the Dom Pérignon Oenotheque. Champagne became famous because of French royalty being toasted by glasses of Champagne. Makers of Champagne have long histories of creating this sparkling white drink to be enjoyed by nobles and royalty. Both Dom Pérignon and Perrier-Jouet are names that mean quality in the world of Champagne. The advertisements of the Perrier-Jouet house boast that they have been the preferred drink of aristocrats and nobles, and Dom Pérignon is well known as a pricey luxury afforded only to the most notable of celebrities and royalty. Champagne flutes are the preferred stemware to serve the sparkly wine as it helps to retain the carbonation that is the trademark of Champagne. There are many types of Champagne glasses, called stemware. One of the characteristics is a smooth finish, which allows for more Champagne bubbles to reach the mouth when sipped. Which champagne is more famous?